To commemorate this event, the British journal Nature selected the NASAâ€™s top ten achievements in its first 50 years There are some of the usual suspects â€“ Project Mercury, landing on the Moon in 1969, launching the Space Shuttle, etc. 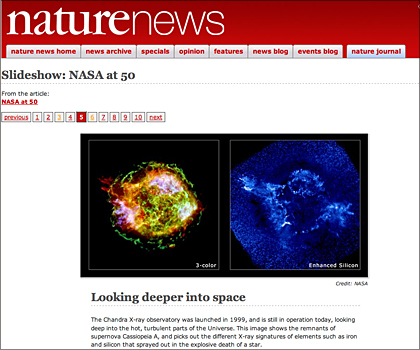 We are happy to point out that Nature also selected Chandra as being one of the agencyâ€™s ten biggest accomplishments. Of course, we here might be a little biased about thinking how wonderful Chandra has been. Itâ€™s great to hear that others may think so as well.